(Nanowerk News) Proteins are the molecular machines of our cells. In order to understand how they function, it is necessary to follow the changes they bring about at a molecular level. This may be done by way of infrared spectroscopy, or more specifically so-called Fourier transform (FTIR) spectroscopy, which can measure the vibrations of the individual chemical bonds in a protein and the changes that take place in them while the protein works. However, an FTIR spectrum of a typical protein consists of several thousand vibrations which overlap and interfere with one another, making it extremely difficult to isolate the series of vibrations responsible for effecting the changes. The spectra of the azido probe (blue group) allow biophysicists to track the changes which take place within the receptors during individual stages of activation in detail. 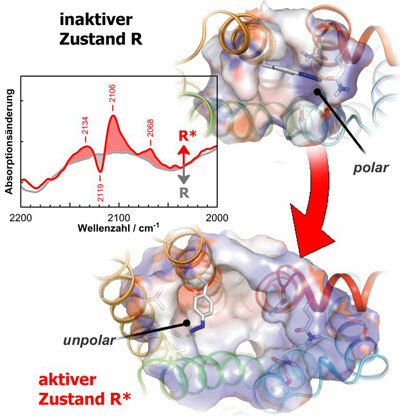 An international team of biophysicists including PD Dr. Reiner Vogel and Dr. Ekaterina Zaitseva at the Institute of Molecular Medicine and Cell Research of the University of Freiburg as well as Shixin Ye and Thomas P. Sakmar in New York and Xavier Deupi in Barcelona has now succeeded in introducing a molecular probe into a protein and tracking the changes caused by it in detail using spectroscopy. Whereas the proteins in our cells are usually composed of a narrowly defined repertoire of building blocks, the amino acids, these cells were compelled to integrate a component introduced artificially by the scientists. This artificial building block, p-azido-phenylalanine, was tailored to the spectroscopic methods and carries a so-called azido group composed of three nitrogen atoms which is absorbed in an isolated spectral area and is thus not affected by other vibrations. The scientists applied this technique to the light receptor rhodopsin, a membrane protein in the sensory cells of the retina which is responsible for sight. When rhodopsin absorbs a photon, it passes through a series of transitional stages, so-called intermediates, in which the changes induced by the light reaction within the receptor spread successively until the receptor is finally fully activated, after which it can activate subsequent elements in the signal transmission chain. With the help of the newly developed technique the scientists were able to analyze these structural changes within the individual intermediates more closely than ever before. In their article in the current issue of the journal Nature (Nature 464: 1386–1389), they demonstrate among other things that the movements of complete structural elements appear much earlier after the absorption of light than previously assumed. The biophysicists are confident that their findings on rhodopsin will also impact our understanding of the activation of other receptors. Its sensitivity to electrostatic change will make this new technique an important new component in the repertoire of biophysics methods.